It's no secret that vinyl is back in a big way. You can find it just about anywhere...from FYE to Urban Outfitters and more. But the best places to buy vinyl, without a doubt, are independent record stores. From friendly service to awesome selections and even vintage collectibles, the selection at Arizona’s indie record stores just can’t be beat. Find something special to add to your collection at the 10 best shops in the state. While the name Asylum Records may make you think of exclusively heavy music, this Chandler record store caters to fans of all genres. You’ll find a vast selection of vinyl LPs, EPs, and picture discs, along with CDs and cassettes, too. In addition to the different forms of music, you’ll also find memorabilia like stickers, action figures, Funko Pops and more. Stop by and find something cool at the Asylum today. With five different locations across the Valley, Zia Record Exchange pretty much, well, has it all. Whether you’re looking for indie rock, metal, punk, or something a bit more obscure, you’ll find it here. There are used and new gems to be found—you just have to look for them. But that’s half the fun of record shopping, isn’t it? Between both Phoenix locations, Revolver Records provides shoppers with two entirely different experiences. The atmosphere of the downtown location is almost like being in your cool uncle’s basement—it's dusty, funky, and incredibly unique—just the way a great record store should be. The East Thomas Road location, on the other hand, is clean and well-stocked with CDs, albums, and high-ticket, audiophile quality items too. No matter which location you visit, though, you’re sure to find something cool at Revolver Records. Grace Records offers “a new spin” on the traditional record store. At this Gilbert shop, you’ll find a crazy huge selection of vinyl priced at only $3, so your dollars can go a lot further. And let’s not forget to mention that they sell new and rare variants also, so you don’t have to worry about not finding something special. And with new releases in-store every Friday, there’s even more reason to come back regularly and treat yourself. If indie rock, indie folk, and plain old indie are your thing, you’ll be in heaven at Stinkweeds. It’s a tiny shop, sure, but it’s absolutely packed to the brim with a great selection of both vinyl and CDs. Have a question about something? Let the knowledgeable, friendly staff help you out. If you’ve ever been tempted to buy a record based off of the album art—you can definitely take your chances here, as there’s a listening station where you can listen to a record before you buy it. Desert Island Records features a great selection of old classics, audio equipment, media, and more. They buy and sell, so if you’re looking for something new or just want to thin out your collection, Desert Island is the place to go. 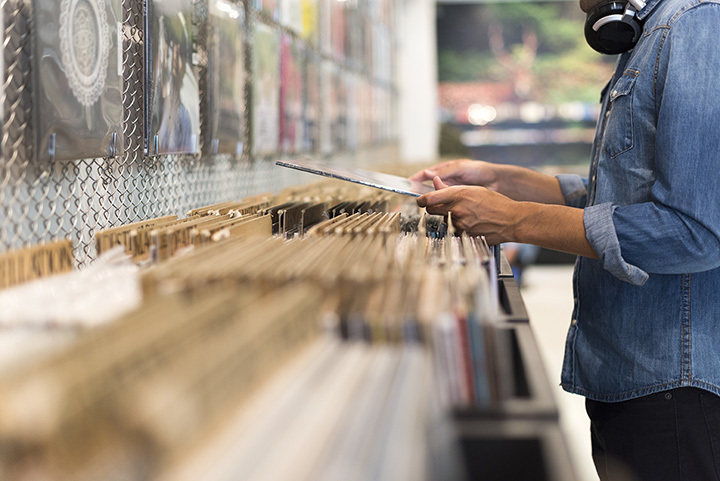 They also offer a few helpful services, such as record cleaning, analog to digital transfer, and CD resurfacing, to name a few—so your music collection will always stay in excellent shape. Locals love the awesome vinyl selection at Puscifer, the fact that they do special orders, and their collection of art and limited run merchandise. The atmosphere here is awesome, and there’s even a barbershop on the lower level, so you can get a clean cut and some sweet pickups before leaving Jerome. Uncle Aldo’s Attic isn’t just a record store. It’s a place for vintage collectibles of all varieties, from toys to books to board games and, of course, records. Mesa residents come back for the friendly, awesome service, vintage atmosphere, and great selection. See it for yourself today. The ‘In’ Groove isn’t your typical dingy, dusty record shop. It’s quite the opposite, actually. The space here is clean, well-lit, well-stocked, and each album is packaged in a plastic sleeve. Love getting your hands dirty going record shopping? Well, you won’t find that here. What you will find, though, is a great selection, pristine records, and an owner that truly cares about his stock and his shop. Be sure to check out the “WTF?” bin before you leave...you never know what you’ll find. Wooden Tooth Records specializes in “all things vinyl.” They sell a variety of new and used records, along with turntables, equipment for your stereo, stuff to take care of your vinyl, and more. Oh, and there are movies, here, too! Have something in your collection you want to offload? Wooden Tooth Records will buy it from you—and they pay more than some other shops, so it's a win-win.